October is National Disability Employment Awareness Month (NDEAM) - LandAjob, a division of NTI, Inc., which also includes NTI at Home and The Staffing Connection celebrates with those that are committed to working with employers and Americans with Disabilities! Looking for a job at any age is hard and looking for a job over 50 isn't an easy task. 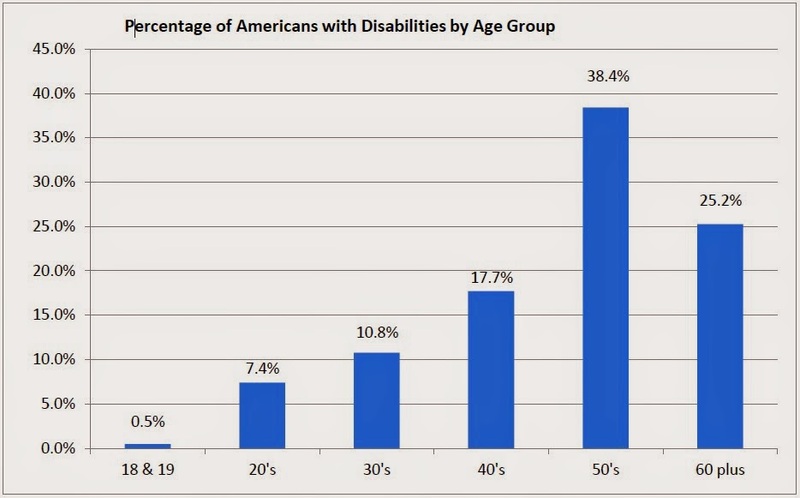 A look at the percentage of those who are disabled in the United States shows that almost 64% are over the age of 50. For those of us over 50, we probably hoped for one place to work for our entire career, promoting and helping a company become successful. And when we were ready to retire, we would get a cake and a gold watch. Well things have changed over the last 20 years! That isn’t to say that some of us may have decided to try something new or find ourselves in a position to look for work due to an illness or another cause beyond our control. If you are in the position of thinking of going back to work and over 50 year old, how do you overcome all the potential obstacles? Many people looking for work can find themselves rolling out the obstacles to success, and in some ways find the whole process too much work. Unfortunately, finding work is a laborious task that most of us don’t want to do. It isn’t easy making this a fun process, especially if you aren’t naturally outgoing. It is pretty easy to sit behind a computer screen and send out resumes and complete on-line applications, it’s anonymous. It doesn’t take someone out of their comfort zone. But sending out your resume on-line is usually not one of the most effective ways to land-a-job. Networking with people you know and even those you have not yet met, is still the most successful way to find work. Eeeeek! That means you may have to talk with people. This can be something outside many of our comfort zones. It is usually good to start with people you know. Just have a conversation about going back to work with a friend or family member, someone you trust or respect their opinion. What pointers could they offer? Do they know of a place that is hiring and would have something that is of interest to you? Would they mind helping you practice your “networking pitch” to others that are distant acquaintances? When you have become more comfortable, would you be willing to attend a job fair? Would you have developed the confidence to talk about yourself, promote your strengths? Are there “job clubs” in your area? Job Clubs can offer support (you are certainly not alone) and even the ability to refine and practice your job search techniques. Engage with people. Show your personality! You may meet new friends. Be careful not to “overshare.” Listening is just as important as talking, especially if it is in an interview setting. Remember to keep it professional. A ten minute conversation about your cat sitting in the window to bask in the sunlight could be a turn off unless the person you are speaking to is a cat lover as well. What are they looking for from this contact and what can you offer them? If it is a job interview, you can offer them an employee who will do the necessary work so they do not have to worry about it, ask good questions. Remember you will want to be sure it is a good fit for you too. This is hard, but not impossible. You may have to overcome your personal obstacles. If you are honest about your abilities and you have a realistic plan in place, finding a job can be done. Learn from the process. If you happen to think you were stumped by an interview question, prepare in case you are asked that question again. Don’t get discouraged. Each interview is at the very least a chance to practice. Celebrate the chance to talk about yourself, meet new people and when you land the next job, let your new adventure begin!